Yeah, I could have broken this up into separate posts. I'm sorry about that. I do have a few things on the way that should keep this blog busy until Series II comes out next week. I've gotten mail lately from all over the blogosphere. Today, I got a package from my good buddy Scott, over at Mr. Baseball-Scott. 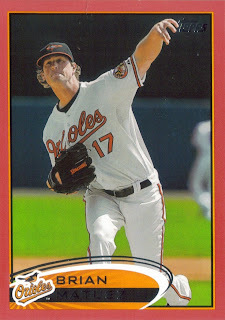 Scott sent me a few Orioles cards and a 2012 Bowman Tim Lincecum for Chris. Thanks Scott! Scott is quite the ball player himself. Check out his blog and follow him, it might encourage him to post a bit more. Next, I got a nice stack of cards from my good friend Andrew from Andrew's Baseball Cards. In the stack was this nice 1st Bowman card of Orioles minor leaguer Ronnie Welty. 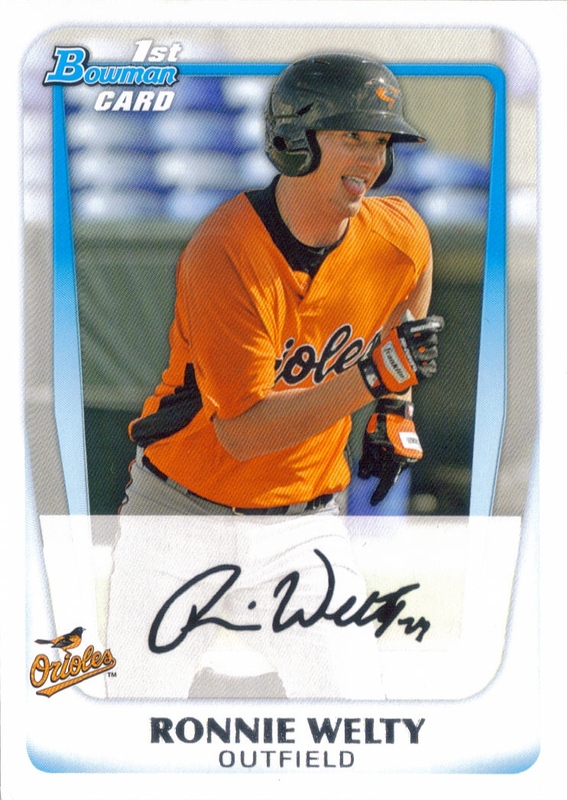 I've actually seen Welty play, when he was on the Frederick Keys, and he is a pretty good ball player. So, I was really happy that Andrew sent me this card. Andrew's a really nice kid who need more blog followers! I got some mail from another good friend, Dustin, over at No Relics Pulled, but I have already put those cards in top loaders and have added them to my collection. Sorry Dustin, but I did want to acknowledge the package you sent and that it was much appreciated. Finally, I completed a rare trade. Rare for me because I usually just send people cards that I think they would like and don't expect anything in return. 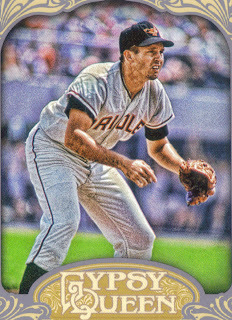 Well, The Rhubarb Runner contacted me about a trade for the Johan Santana patch that I pulled out of 2011 Topps Marquee. In exchange for the Santana, I got this Bowman Heritage auto of former Oriole Brandon Snyder. The auto is on card, and the card itself looks sweet. 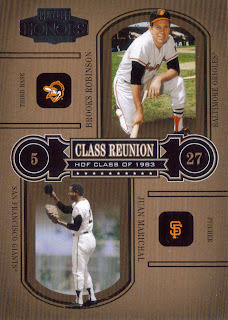 Among other cards I got from the rhubarb smuggler, was this really nice Playoff Class Reunion Brooks Robinson/Juan Marichal. 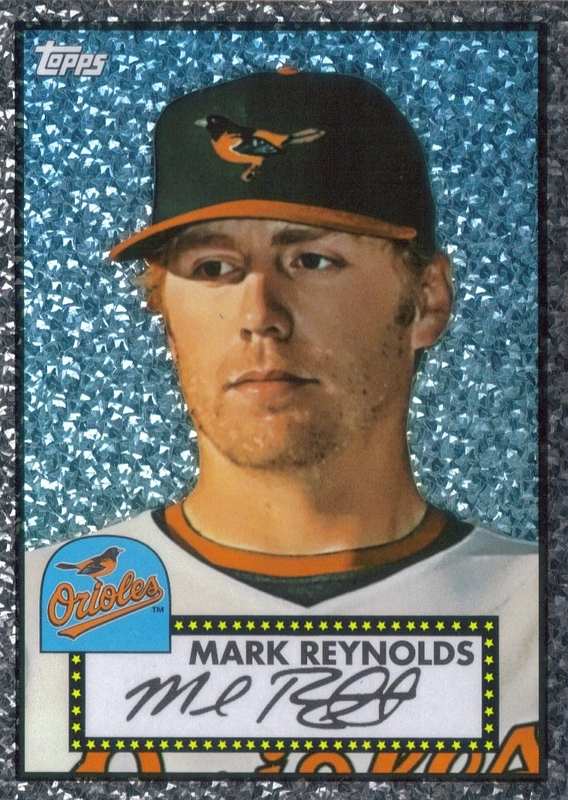 I love the seriously old school Oriole logo on this card. So, thanks for all of the mail, guys. Keep it coming! Today, the Orioles and Adam Jones finalized a 6-year, 85 million contract extension that will keep Jones in Black and Orange through the 2018 season. The contract includes a full no trade clause, no option years at the end of the deal and a portion of Jones' annual salary will go toward Orioles' charities. It is really great to see that Jones will be an Oriole for a long time and that the team is serious about winning. They have faltered over the last 5 games, but still remain atop the AL East, leading Tampa by one game. If they take today's game against the Royals, they will still gain another series win. This season is shaping up to be a special one for the O's and today's signing of Adam Jones is yet another highlight. The Orioles are playing some great baseball right now. I have been reluctant to post about it because they got off to a good start last year, only to fall apart quickly and fade to the basement of the AL East for yet another season. They have had 14 straight losing seasons since 1997 when they last went to the playoffs. I have a friend who is a Red Sox fan who is still talking trash. I don't want to respond to his trash talk because, one, I don't gloat, and two, I've been fooled before. 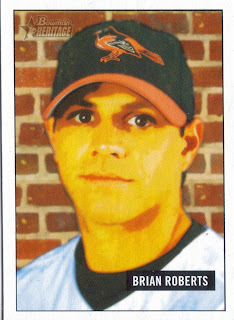 The Orioles were playing great baseball in the 2005 season. They spent much of the first half in first place. I believe 4 of their players were selected to the All Star team. Then the wheels fell off. This season, I'm sensing a much different feeling than in the years since my senior year of High School. The Orioles are playing good baseball. It isn't quite great. Not yet. They still have too many errors. Jake Arrieta and Tommy Hunter have been inconsistent. 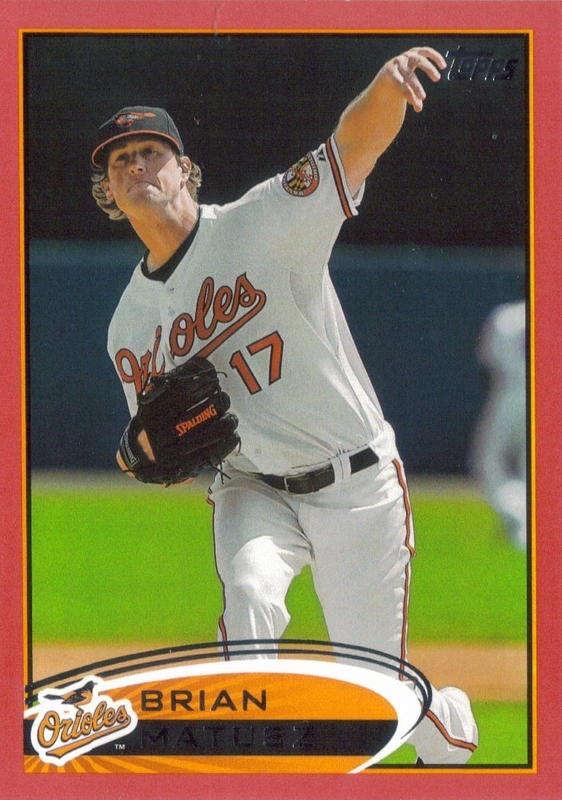 Brian Matusz's season last year left such a bad taste in my mouth, it'll take more than Crown Royal to burn it out. Yet, he has won his last 3 decisions. He has looked pretty good doing it, too! I hope he is back to his late 2010 form. Chris Davis is flirting with .300 to add to his 0.00 ERA and 1.000 win percentage. Adam Jones has emerged as a superstar and is about to be paid handsomely. Matt Wieters has emerged as the best catcher in the game. I want him calling the games for all of the O's pitchers, but I know he needs rest. His bat is mired in a tough slump, but I know he will get out of it. Brian Roberts is about 3 weeks away from returning, after many pundits felt that his career was done. 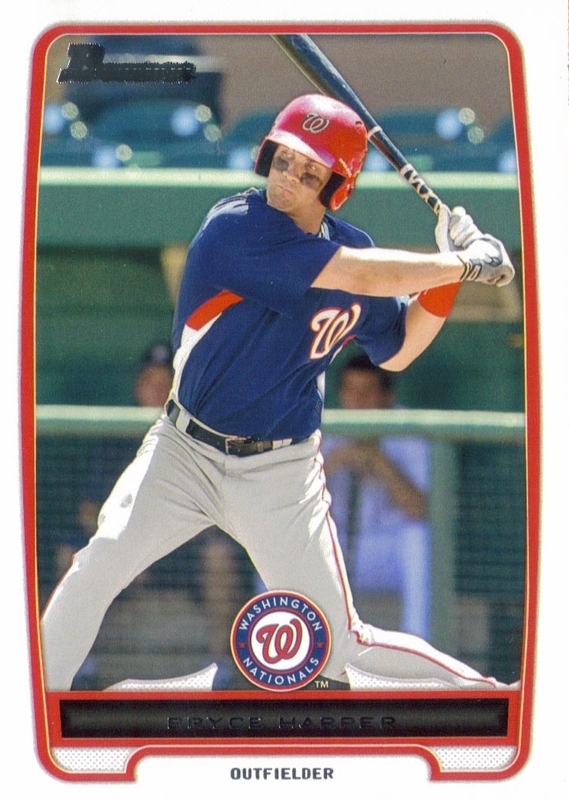 Nolan Reimold was on the verge of busting out before a bulging disc in his cervical spine derailed him. If he can get back and resume his early season form, watch out! Jason Hammel has been a pleasant surprise. What a pickup! I don't like to brag or gloat about my team doing well, but I deserve to enjoy the good times. It has been so long since I have been able to look at the box scores and have a good feeling about them. I'm not sure if they can sustain this for the whole season, but, WHY NOT? Why not the O's? Let's keep it up, it has been a fun season so far! Brian Roberts To Go On Rehab Assignment Tomorrow! Finally, after being out for over a year with post concussion symptoms, Brian Roberts will be making a rehab assignment with Double A Bowie starting tomorrow. It will be awesome if Roberts can get back to the majors. The Orioles are pretty beat up right now with several players on the DL. Hopefully Brian can get back quickly and resume his stellar career. 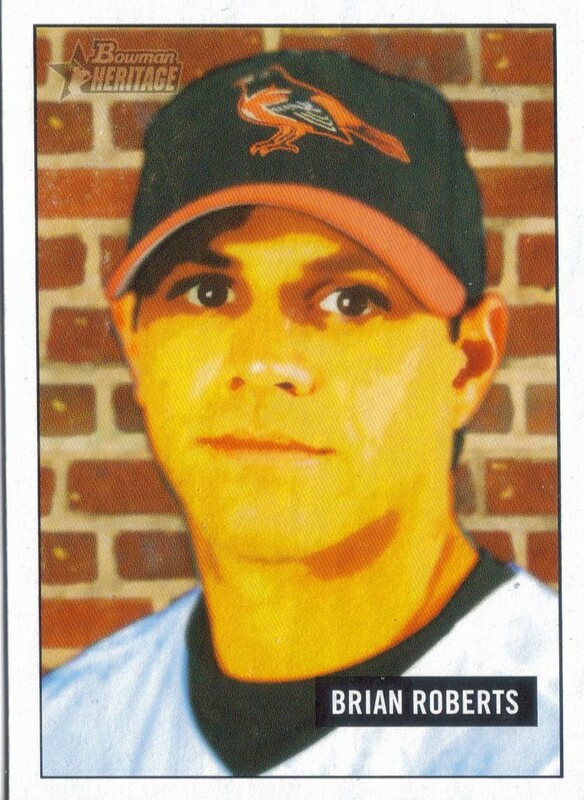 A doubles machine, Roberts will give the O's stability at the top of the batting order and speed on the basepaths. Welcome back Brian! You definitely have been missed! I've been so busy lately, when I get home, I don't feel like scanning bunches of cards. Pure laziness on my part. I've gotten trade packages from Nachos Grande, Rhubarb Runner, No Relics Pulled and Andrew's Cards. I need to get posts up for all of those trades. I hope to do it eventually. If I don't get to them, sorry guys. It doesn't mean I don't appreciate the trades, quite the contrary. I get so excited to get the cards, they immediately get put in top loaders and added to my PCs that I forget who sent what. Oops. Anyway, I did get a chance to go by my LCS today and picked up a bunch of packs and the shopkeeper was nice enough to let me go through his pulls from 2012 Bowman. I picked up some Orioles and a few others from his stack of cards, namely the below Bryce Harper, some Yankees for Drew and an Aroldis Chapman for Andrew. I'm going to add this Harper to my 'treasure box' which includes cards I like of Hall of Famers and other players. I don't think I'm going to start a Harper PC, but I do want to add a couple of his early cards, just to say that I have them. 2012 Bowman doesn't have a whole heck of a lot of Orioles prospects that I have seen so far, but Nicky Delmonico (above) looks to be a real good prospect. His dad is the coach at Tennessee, so he has baseball in his blood. 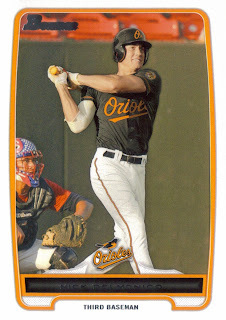 I hope that he is a good position player prospect for the O's, something that they desperately need. 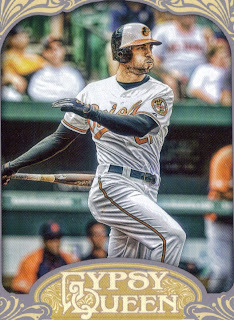 I like the Bowman's Best cards. Here is one of Miguel Sano. He was a pretty highly sought after international free agent. I haven't heard much about him after he signed, but apparently the raw skills are there. We'll see about that. 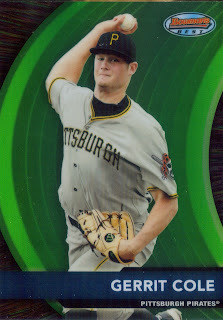 Finally, here is a nice Bowman's Best of this past year's number 1 over all pick, Gerrit Cole. The Pirates have had a tough time developing their number one picks, so let's hope that Cole is their exception and helps the Pirates get back to a winning organization. 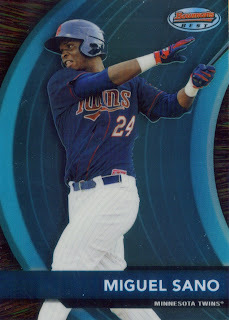 In all, 2012 Bowman isn't too bad. I didn't get a whole lot of variations or parallels. I also didn't get any autos, but having purchased only 7 packs, I didn't really expect much, if anything, at all. I do like that they went away from the standard black border that they have used for the past several years. Sometimes change is good. Christopher got a real treat today when he had the opportunity to meet his favorite wrestler, Sheamus, at the Carolina Ale House in Cary, NC. Sheamus was doing an appearance to promote this weekend's Over The Limit Pay Per View. Last year, my good friend Mike got Chris a photo autographed and recorded a video greeting from Sheamus to Chris on his phone. We were the first in line to meet Sheamus, and as he came in the room, he immediately walked up to Chris, said hello and shook his hand. He then called us over to his table where he spoke with Chris and signed an autograph for him. 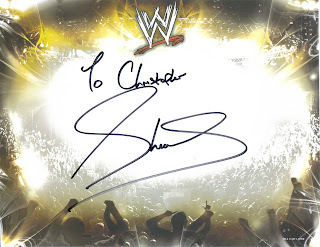 I told Sheamus how much Chris loved to watch him and how much we all appreciated his video message to Chris last year (to which Sheamus said that he remembered). I offered up a baseball for him to sign (since I have former World Champions Harley Race and Chris Jericho) and Sheamus looked really apprehensive. He felt bad because he hadn't had much experience signing baseballs, but I assured him that any effort was ok with me. He also told me that since he was born in Ireland, he had never even seen a baseball until he came over to the States a few years ago. In all, the signature turned out fine. I really like it. He also signed one of their standard autograph pictures for me as well. Here is the one he signed for Chris. Chris was so excited to meet his favorite wrestler. He talks about and emulates Sheamus all the time, so this was a really cool thing for him to be able to do, at 6 years old! He has already met a number of 'famous people.' I'm glad, as a father, to be able to help my son experience some of these things. I was able to knock a few cards off of some set needs at last week's show really cheaply. I got the three below 1959 Topps cards for a dollar a piece and the 1971 Topps card for $5 since it is a high number. The green Willard Nixon looks really cool, as always. I also like the old Red Sox logo, the sock batting. Really cool old logo, I think. Finally, here is a pretty sharp 1971 Topps high number. 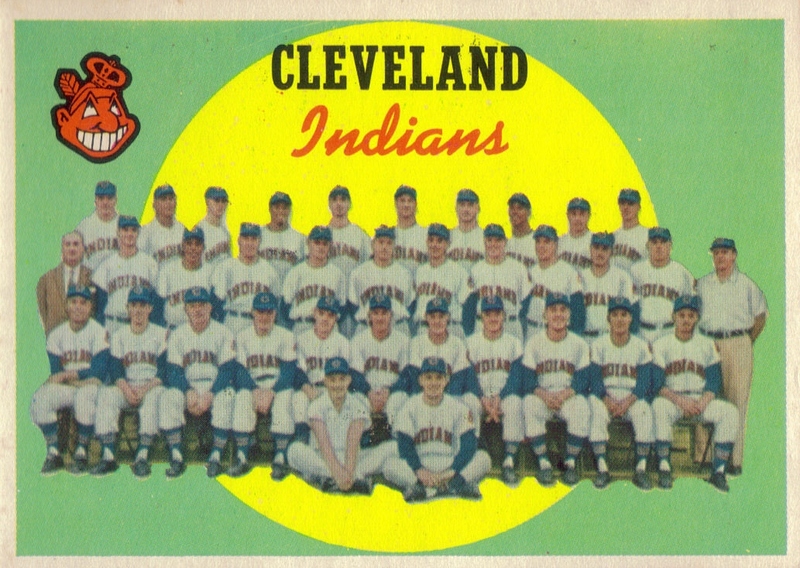 It is going to take me forever to finish the 1971 set, but slowly, I am chipping away at it. 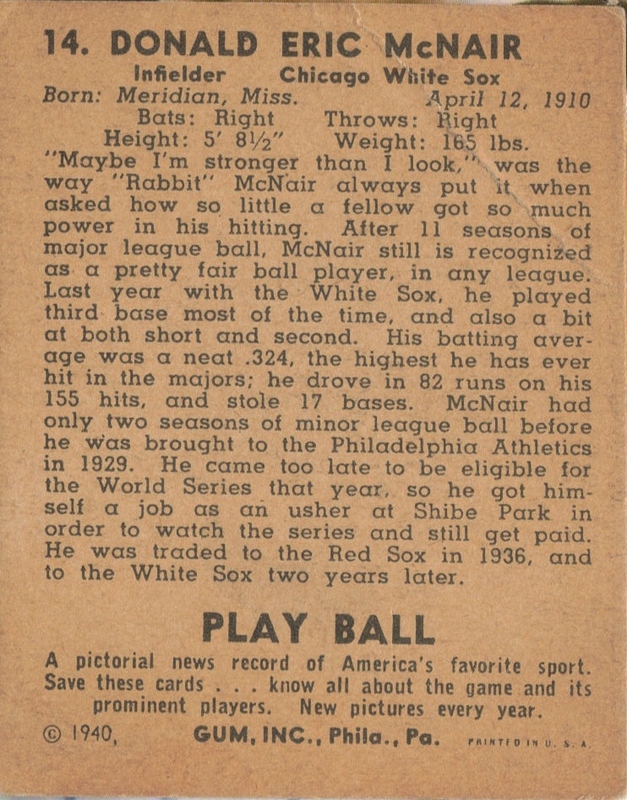 I didn't buy much at the show, but I did come away with a few things, the most notable was my Catfish Hunter ball and my 1940 Play Ball Eric McNair. I probably could have bought a lot more, but I did a good job of holding back and actually bringing a little money home. I need to save up for Series 2 when it comes out in a couple weeks and I also have been eyeing a ball on Ebay for some time now. I admit, I'm not the biggest football fan. I mean, I used to be. When my younger brother played college ball, I would go to many a game. Even before that, when my older brother (we were in the same grade) played high school ball, I went to almost every one of his games (except for the one Mom and I got lost going to). I casually follow the Carolina Panthers because of the 11 years I lived in Charlotte, but other than that, I don't follow it like I do baseball. I know of some of the legends of the game, but until I read Drew's post on him, I had no idea who Chuck Bednarik was. I thought the photo Drew got back from him TTM was amazing, though and during one of our Skype chats, I asked him if he could hook me up with a Bednarik photo that I could try to get signed TTM as well. Well, Drew sent me one a little while later in a really nice package of stuff, so I was able to send to Mr. Bednarik and request an autograph. As you can see above, he signed the photo and filled it with inscriptions. 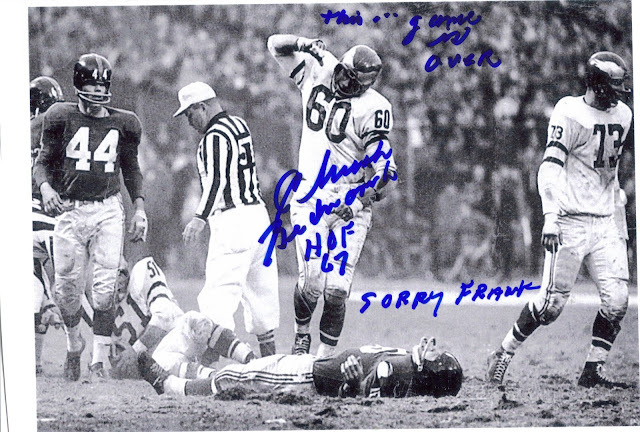 In this game, he laid out Frank Gifford (this was 1960) and caused Gifford to miss the next 18 months due to injuries sustained from the hit. Wow. Bednarik (born in 1925) played for the Philadelphia Eagles from 1949 to 1962 and was elected to the Pro Football Hall of Fame in 1967. Thanks for the photo and the idea, Drew! 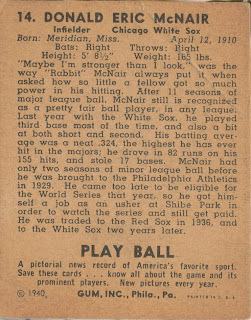 You all may remember my recent blog post where I received some photos and a letter after corresponding with Don McNair, Jr., son for former big leaguer Eric McNair. If you need a refresher, here is the post. 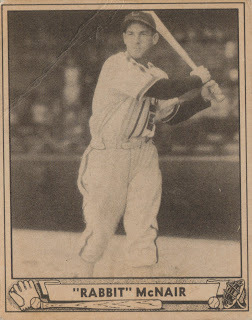 This is now the second Play Ball card that I have, since i also have a Jimmie Foxx. They are really nice cards that age very well. I thought it was really funny that I walked by a table and the card just jumped out at me. I had to have it, since i had a kind of 'Six degrees of Kevin Bacon' moment. 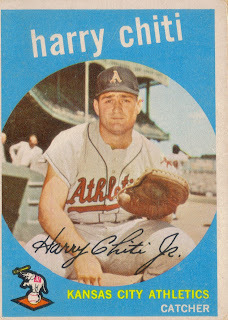 Plus, it is just a really cool vintage card that you don't see every day. I hope you all enjoy it as much as I do. I'm wore out. It was a nice, long day at the card show today. I passed out links to my blog to several people, so let's hope that I get some reads from it. I saw some friends of the blog today. I also met fellow blogger Scott and his family, which was really nice. What a great group of people they are. Scott had an amazing pull, but that is for him to tell over at his blog, so click the link here and hopefully he will get it posted soon. I had my own share of good luck today as well. I spent $5 and got 3 1959 Topps for my set, one 1951 Bowman for my good friend Andrew and a 1952 Bowman Ray Scarborough for another friend who collects him. Not too bad, I think. I have been needing Catfish Hunter for a while now. I was going to get one from another good friend, Dustin, but he had forgotten his ball was inscribed to him and I thought it would be better if he kept it. So, I was able to add this one and Dustin was able to keep his. James Augustus 'Catfish' Hunter was born in Hertford, North Carolina in 1946 and played in the majors from 1965 to 1979 for the Kansas City/Oakland A's and the Yankees. He won the Cy Young award in 1974 when he went 25-12 with an ERA of 2.49. 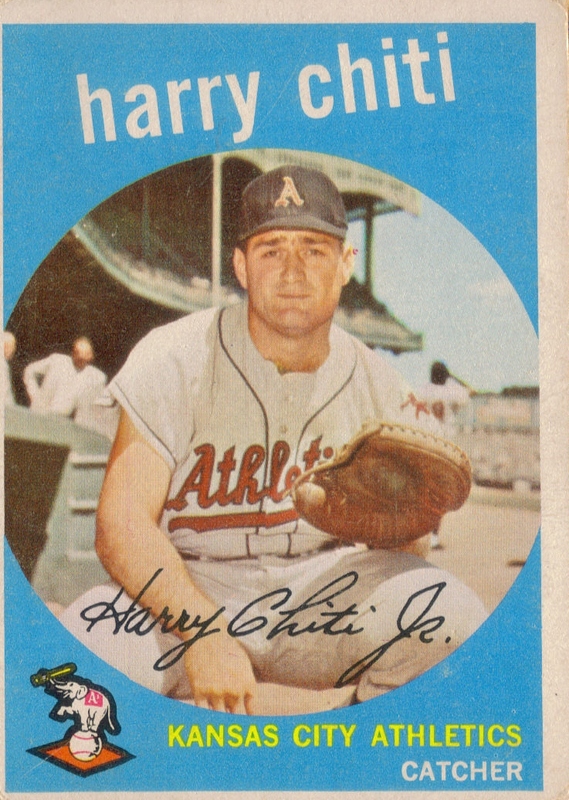 He also won the World Series in 1972 through 1974 with the A's and 1977 and 78 with the Yankees. 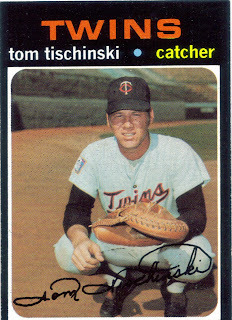 He had a career record of 224-166, 2,012 strikeouts and an ERA of 3.26. 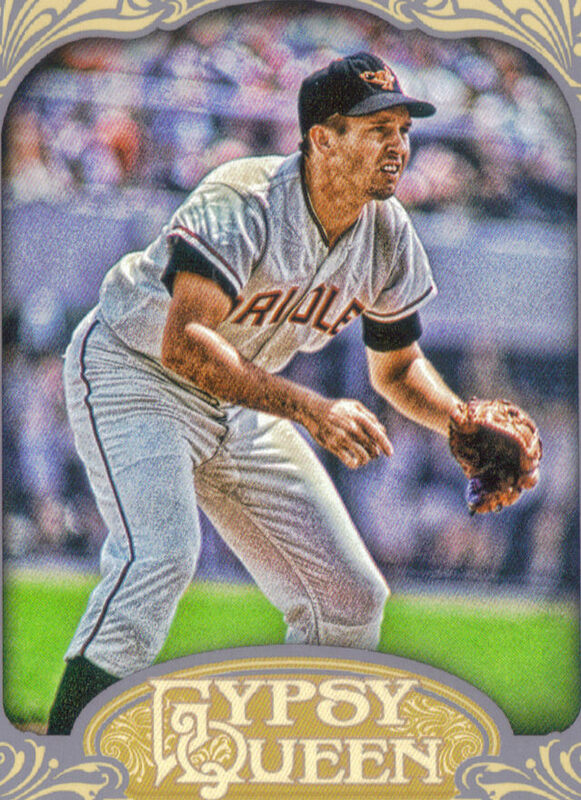 Hunter was elected to the Hall of Fame in 1987 (his 3rd year of eligibility) when he was named on 76.3% of the ballot. He passed away in 1999 due to complications of ALS, also known as Lou Gehrig's Disease. I always like getting mail from my good friend Drew because I never know what will be inside his envelopes. Drew does a good job of keeping an eye on cards that I want and always surprises me with some goodies whenever he gets the chance to send them my way. The highlight of his latest package (which i got on Friday before I left town) was the above Virgil Trucks signed baseball card from Topps Archives. Anytime I can add a new Trucks card to my PC is a bonus as there aren't too many of his cards left that I don't have. 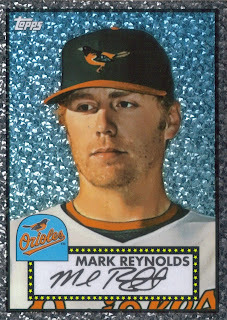 I liked this Mark Reynolds Black Diamond from the 2011 Topps Wrapper Redemption program. I really want the Virgil Trucks auto from this set, so I'm keeping a lookout for those. Finally, here is a 1963 Post Russ Snyder. It is a really cool card. I think I sent Drew a Post Elston Howard, so this one is a nice return, haha. I appreciate the cards, Drew! I will definitely try to find you something cool from this weekend's card show! 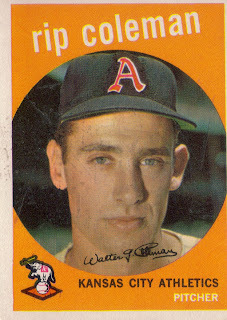 I thought it would be a good idea to show some of the 14 1959 Topps I chipped away from my want list during last weekend's visit to the Columbia antique shop. 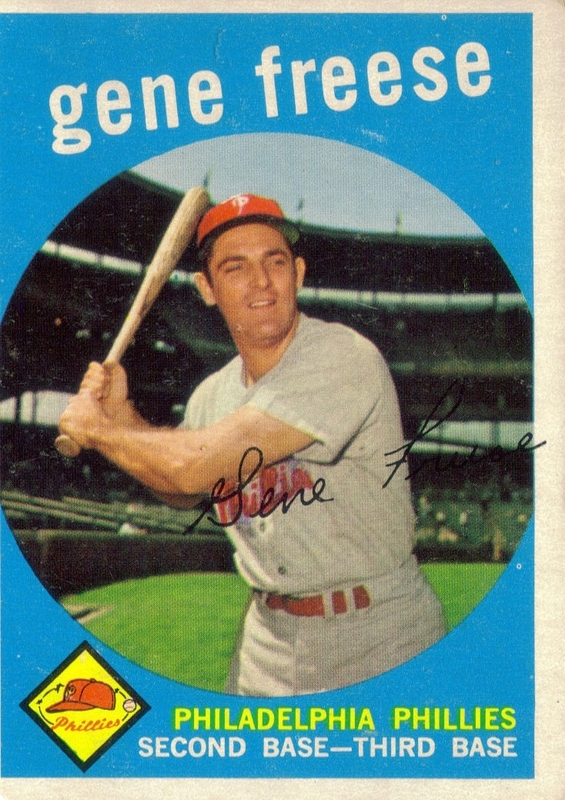 I thought the blue on this Gene Freese was really nice. Again, the main reason I enjoy this set is because the colors of it are so awesome. I got this Cleveland Indians team card, which has an unmarked checklist on the reverse. It looks really sharp. 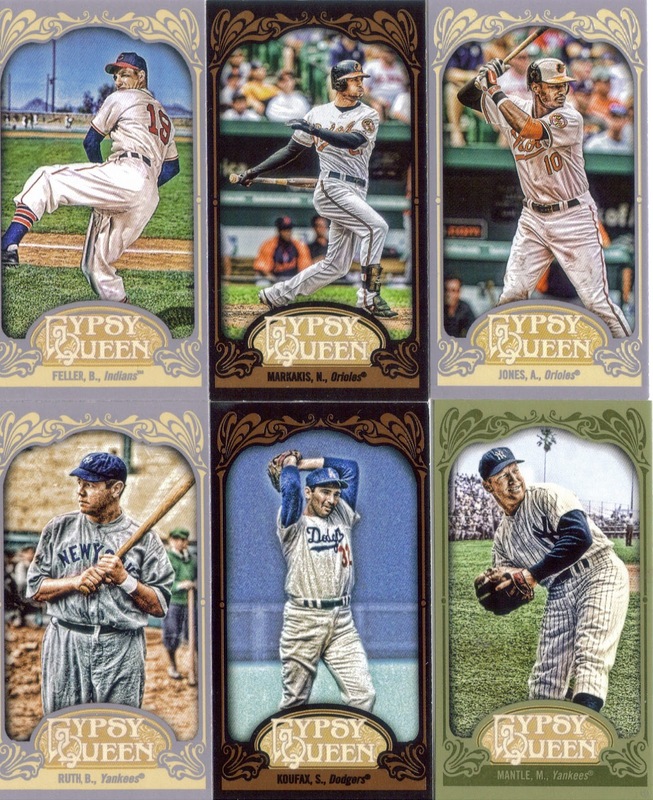 I imagine some of the more popular teams from that era (Yankees, Dodgers, etc) are pretty expensive, especially if you want them unmarked. 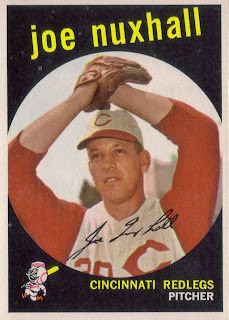 I thought this Joe Nuxhall was really cool. Nuxhall first pitched in the majors at the age of 15 back in 1944 when he threw for 2/3 of an inning. Finally, probably the biggest name I picked up this time around was this Johnny Podres. 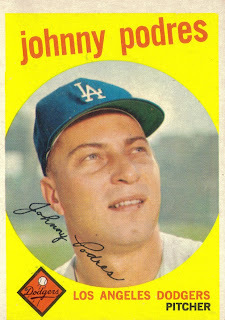 Podres was a pretty good pitcher for the Dodgers in the 1950s and 1960s before moving on to Detroit and San Diego at the end of his career. So, there you have it, a few of the 1959s that I got. I might get some more this weekend at the Raleigh card show, so we'll have to see. I got yet another TTM success yesterday when I received this signed baseball from former pitcher Jim Kaat. I mailed to Kaat on April 23, included a $25.00 donation to his foundation (cancer research in memory of his wife, Mary Ann) and got my ball back on May 7 for a 14-day TAT. Kaat (b. 1938) played in the majors from 1959 to 1983 for the Senators/Twins, White Sox, Phillies, Yankees and Cardinals. Over a career that spanned 4 different decades, he amassed a record of 283-237, 2,461 strikeouts and an ERA of 3.45. He won the World Series with the Cardinals in 1982. Kaat appeared on the Hall of Fame ballot beginning in 1989. He received as much as 29.6% inclusion on subsequent ballots before falling off the ballot after his 15th year of eligibility in 2003. He narrowly missed being elected to the Hall of Fame on the 2012 Veterans Committee by two votes. He needed 12 of the 16 votes required and received only 10. Kaat is my 56th TTM success. Currently, I have 7 baseballs out for TTM, but I'm thinking at least 3 of them will be written off as failures. Time to start looking for new people to send to. Anyone have any ideas? Before I left town on Friday, I made sure to check the mail. In my mailbox was another of my padded mailers, this time containing a ball signed by Bob Skinner. I mailed to Skinner on April 28, 2012 and got my ball back on May 5, making him a 7-day TAT. Bob Skinner (b. 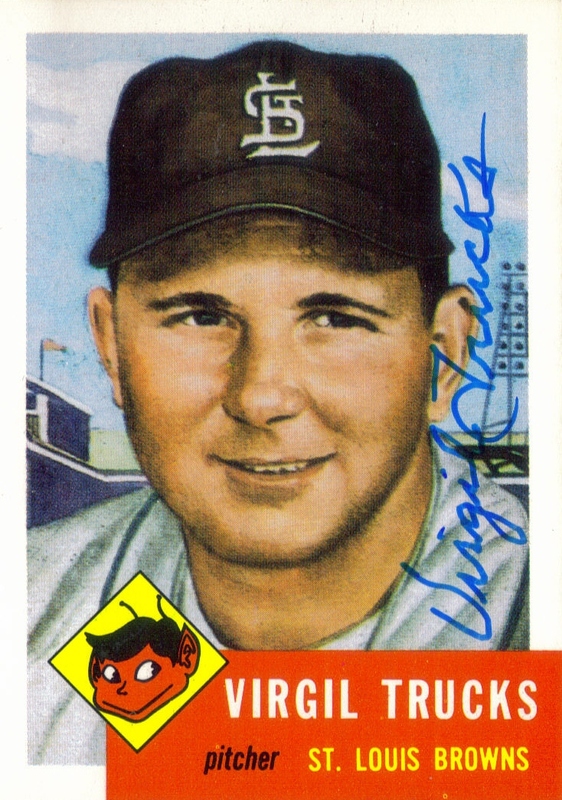 1931) played in the majors from 1954, 1956-1966 for the Pirates, Reds and Cardinals, winning the World Series in 1960 with the Pirates and in 1964 with the Cardinals. He retired with 1,198 hits, 103 home runs and a .277 batting average. Skinner is my 55th TTM success. He signs for free and is very fast so if you are a Pirates or Cardinals fan, you really should drop him a line and try to get a success as well. I spent this weekend visiting my younger brother in Columbia, South Carolina for my niece's 4th birthday party. As always, when I'm in Columbia, I visit this really awesome antique shop called 'Chic Antiques.' The shop is run by a friend of a friend (it's a small world) and I always like going and saying hello. I always seem to find some good deals while I'm there. I got myself several 1959 Topps for my set (which I will show later), a couple cards for my good buddy Andrew, a 1961 Topps Boston Red Sox team card for Scott, 2 1963 Fleer for another friend and finished up with this amazing signed baseball for a paltry $50 bucks. I told the shop keeper that I was looking for some Hall of Fame signed baseballs and he brought out several to see what I needed. He showed me this Willie Stargell and quoted me the amazingly low price of $50, so I had to jump on it. The ball is not authenticated, but I know that it is legit. I have 100% confidence that anything the guy sells me is authentic. Willie Stargell played in the majors from 1962 to 1982, all for the Pittsburgh Pirates. He won the World Series with them in 1971 and 1979 (against MY Orioles). He retired with 2,232 hits, 475 home runs and a .282 batting average. He was the 1979 NL MVP. Stargell is now my 65th Hall of Fame signed baseball. I'm hoping I can knock off a couple more at next week's card show. I was pleasantly surprised today to find another of my padded mailers in my mailbox. It has been a while since I have gotten TTM successes in rapid succession, so I was very pleased that this ball came so quickly after a previous success. 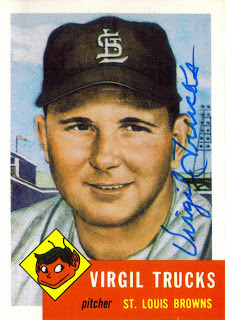 My 54th TTM success, Chuck Diering, came after I submitted my ball on April 28. This was a 5-day TAT. He inscribed the ball 1954-1956, First MVP and 1954 Inaugural Orioles. Diering, born in 1923, played from 1947-1952, 1954 to 1956 for the Cardinals, Giants and the Orioles. 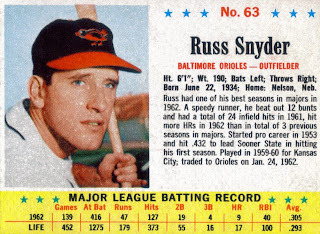 He was a member of the 1954 Orioles, the first season that the O's played in Baltimore following their transition from the St. Louis Browns. 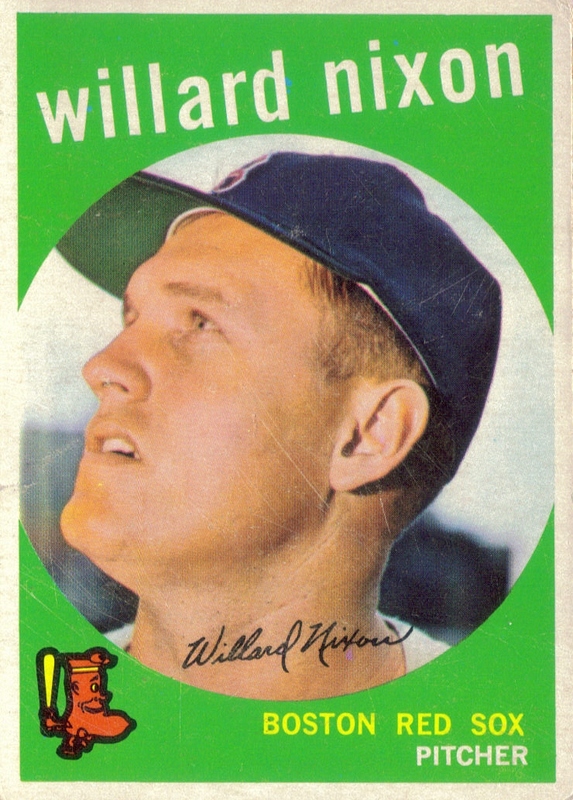 Diring his career, he had 411 hits, 14 home runs and a .249 batting average. 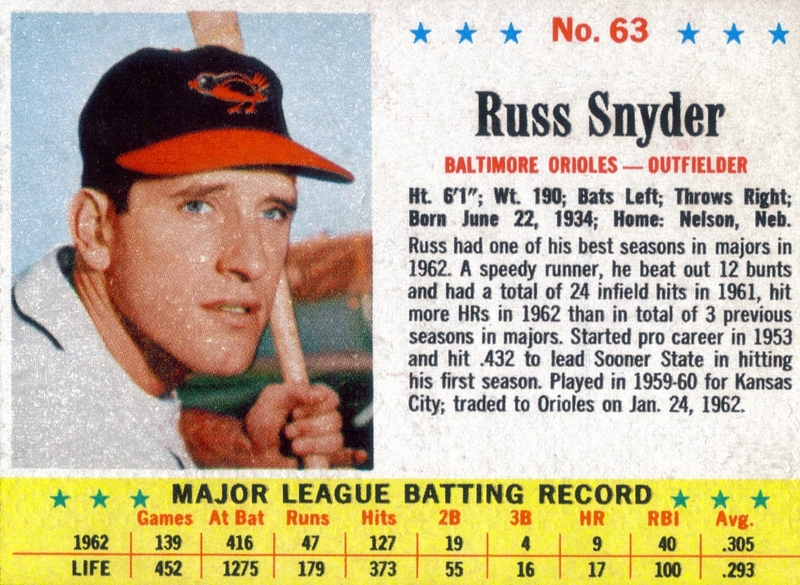 He became part of the Orioles when the team selected him from the Pacific Coast League as part of the Rule V draft in 1953. We had great fans that supported a mediocre club. Was proud to be selected first MVP in Baltimore, Chuck Diering. I'm really happy that I got this success back, especially when it came so fast! I really appreciate the time Mr. Diering took to write the note and add inscriptions to the ball, and for free! I'm starting to feel better, so hopefully, this illness is moving behind me. 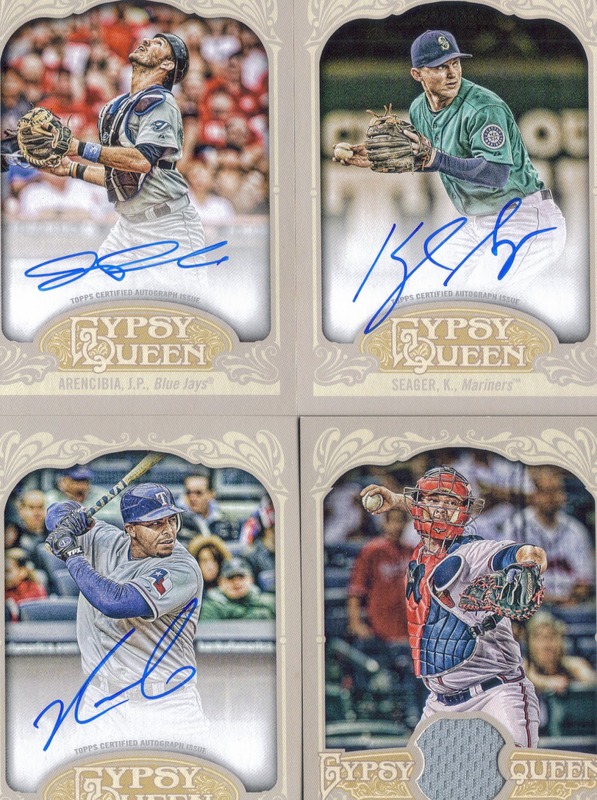 I meant to post the results of my Gypsy Queen box break the other day, but I wasn't really feeling up to it, so here it is today. I got a couple Orioles, including the above Brooks Robinson and the below Nick Markakis. 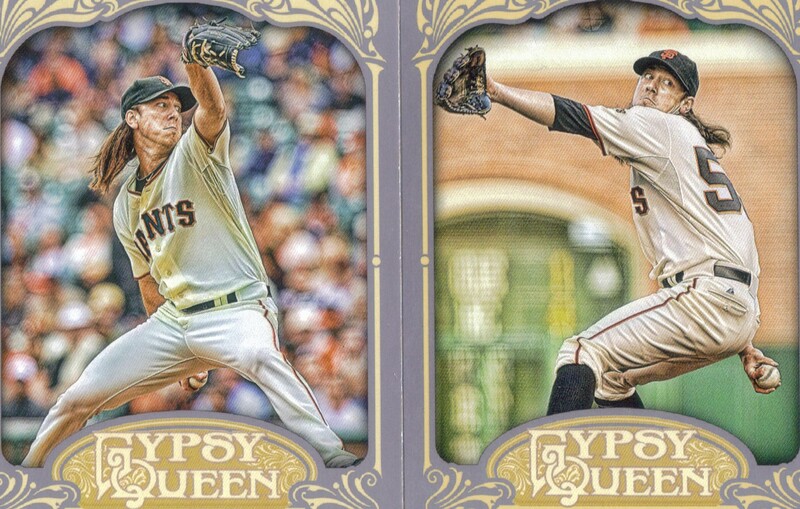 I got two different Tim Lincecum cards, so one has to be the SP variation. 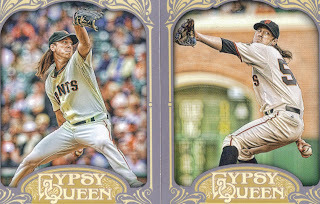 Not bad, considering they will be assumed into my son's Lincecum collection. I'm glad I got his variations as opposed to someone else's. I was supposed to get 2 relics and 2 autos, but I got 3 autos and 1 relic. 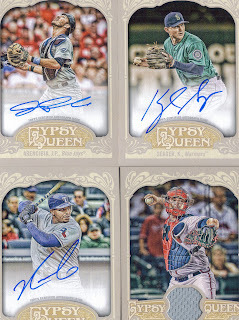 I got autos (on card) of J. P. Arencebia, Nelson Cruz and Kyle Seagar and a relic of Brian McCann. Finally, I got some nice minis as well. I got basic minis of Bob Feller and Babe Ruth, a Green mini of Mickey Mantle, black minis of Nick Markakis and Sandy Koufax and an exclusive mini of Adam Jones. I think I did pretty well with the box break. I'll be able to sell off a good bit of it at the upcoming card show and make my money back. It would have been nice to pull the Koufax auto, but oh well, I can keep dreaming. I've been really sick the past few days. I was sick enough today where I excused myself from work an hour early, came home and laid down for a nap. It appears that I am going to be sidelined with "Flu-like Symptoms", much like some of the Orioles have been dealing with lately. I woke up from my nap to find one of my padded mailers on my dresser and inside was this ball. My roommate on road trip was Pete Appleton. I worked out a lot with Buddy Lewis, was close with pitcher Dutch Leonard. I played against Mickey Vernon in the Minors. "Uncle Sammy" got me for almost 5 years - March 3, 1941 to November 1945. I tried baseball in 1946 - didn't feel right - I quit. Peace be with you!! The short response sure was welcome! 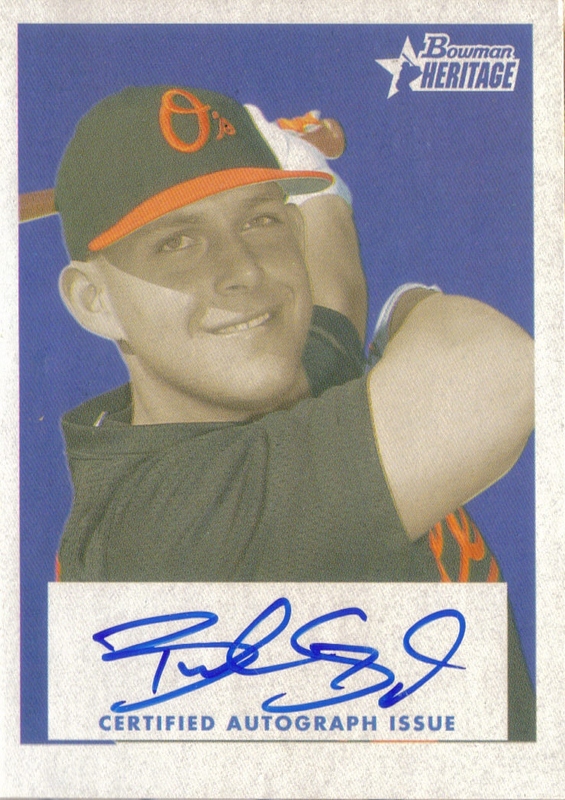 Palagyi is my 53rd TTM success. I mailed to him on April 13, 2012 and got my ball back today, May 1, 2012, making him an 18-day TAT. Now, I think I'll go lay back down.